Ekaterina Vasseva-Ikonomova was born and lives in Sofia. She found interest in classical guitar at the age of 11. For several years she played with the Orpheus Guitar Orchestra under the guidance of Stefan Vladimirov. Later she studied classical guitar with Valentin Valchev as well as pop-singing, blues and improvisation with Georgi Mirchevski. She got a B.A. from AMDFA – Academy of Music, Dance and Fine Arts – Plovdiv, in the class of Milena Valcheva, and a M.A. from National Music Academy “Prof. Pancho Vladigerov” – Sofia, in the class of Rossen Balkanski. In 2001, she was a finalist at the 8th International Classical Guitar Festival and Competition in Plovdiv. 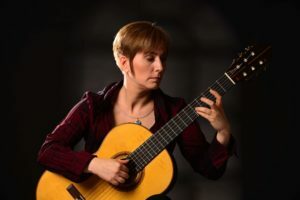 She pursued her development as a guitarist in Bulgaria and abroad in master classes with Eric Franceries, Prof. Aldo Lagrutta, Prof. Bernard Hebb, Scott Tenant, William Kanengiser, David Russell, Manuel Barrueco, and others. In 2007, she co-founded, together with Milena Valcheva, Valentin Valchev and Emanuel Ikonomov, the BalkaNota music publishing house. Ekaterina Vasseva-Ikonomova has over 20 years of experience as a classical guitar teacher, during fifteen of which she was with the Arts Department of Chitalishte “Nikolay Haytov” – one of the leading community centers in Sofia. She is currently working for her own guitar studio “Kitarentino”.